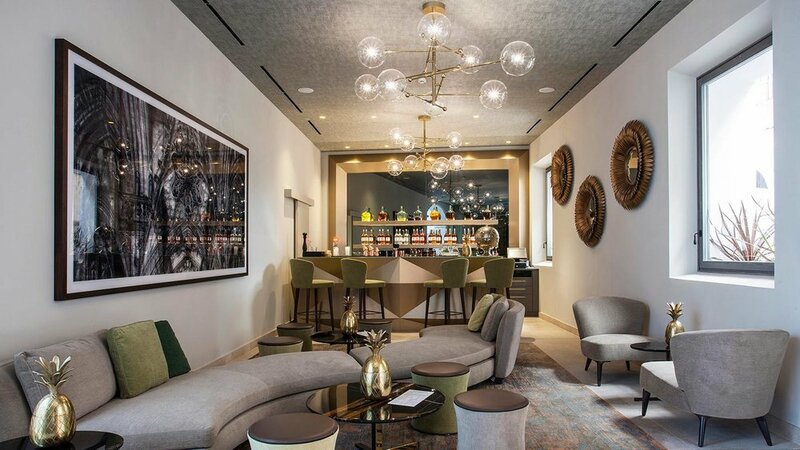 Nestled in the cobbled streets of the old town is where you'll find the refined Hotel Sant Jaume - a discreet and sophisticated hotel among locals. With a premise to offer a place where “even the most local to become universal”, is a gentle nod to them positioning themselves as a luxury hotel that makes Mallorca accessible. The former 18th-century mansion hosts an in-house restaurant Tomeu Restaurant amb Arrels, led by Tomeu Caldentey - the first Majorcan chef to be awarded a Michelin star. When you stay at Hotel Sant Jaume, you are on a creative, elegant and cultural journey layered with curated experiences that remain true to their roots. Approaching the reception area, you are greeted by an impressive art installation by Spanish artist, Robert Ferrer i Martorell. It very much sets the tone and is complemented by the contemporary copper hue of the sofas and designer light stand. This is adjacent to the fluidity and sleek lines of the curved seating area in the lobby area, adorned by an impressive light fixture by Ingo Maurer and Davide Groppi. Impressive works by artists such as Robert Ferrer, Roland Fischer, Jose Luis Cremades, Albert Pinya and more can be found in the communal spaces of the hotel. 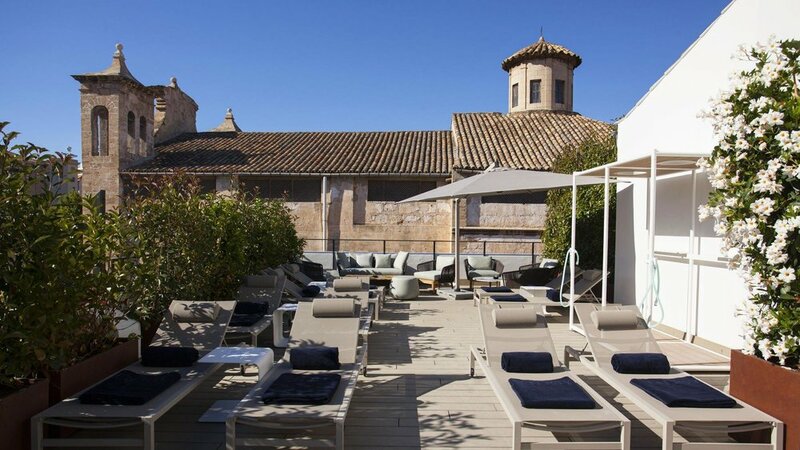 Boutique Hotel Sant Jaume exudes elegance. From the moment you enter to the service at the bar and dining experiences that you embark on at the hotel, you are very well looked after. Attention to detail is immaculate. We very much love the hotels within the IT Mallorca Unique Spaces Group, and this establishment is a fanciful and strategic addition - in a very discreet yet prime location. Rooms are classic and elegant with neutral tones and set against carefully chosen textiles. Most interesting is the linen used on the wall where the master bed is in each room. The clean and modern bathrooms include separate rain showers, comfy make-up stool, and Korres natural products amenities. Illy espresso machines can be found in the Junior Suites, and kettles are available on request. Expect to wake up on top of the world and with a real taste of Mallorca. The hotel stays true to their roots, offering a delightful spread of Mallorquín dishes made with local products. The local cheeses, ensaïmada pastries and more were very much appreciated. The design of the space is equally fantastic, lined with their signature quirky pineapples and leafy wallpapered walls along with gold trimmings in aspects of the decor. Then there is, of course, their distinctive Tomeu Restaurant amb Arrels, which brings creative cuisine to an exceptional level. Signature dishes include Port Soller egg in Maltese sauce served on a bed of thinly sliced red prawns, consommé of tomato with pickled vegetables, and rockfish with spearmint aioli. The restaurant has two gastronomic menus, the five-course Santa Magda at €55 and the eight-course Sant Jaume at €80. Please note that this has now been replaced with a new food concept, Fabiola Gastronomic Garden. A wellness centre which includes a heated pool, contrast shower and Finnish sauna can be found on the lower floor of the hotel. This is in addition to a private cabin for those that want to indulge in organic beauty treatments or massages. Guests can also enjoy massage treatments up on the rooftop or in private suites on request. Tips - You must grab an ensaïmada and other goods at the Mallorquín bakery Forn de la Soca opposite the hotel.